Best known for old temples, boisterous deer, an expansive park, and a massive wooden temple with a giant bronze Buddha statue, Nara is one of Kansai’s most beloved day trips. But consider the prefecture’s serene gardens, forested mountains, distinctive limestone caves, and tranquil hot-spring retreats, and suddenly you realize you need a weekend or more. If you find yourself headed there this season, follow our tips for a spectacular four-day jaunt in Nara Prefecture. No trip to Nara could be complete without seeing the world’s largest Buddha statue at Todai-ji temple in the grounds of Nara Park. While walking from the JR train station to Nara Park, drop into Nakatanidou Mochi Shop where staff members pride themselves on being the fastest mochi pounders in town! Watch them make sticky rice cakes at lightning speed and sample the goods afterward. Stop off at the small, quaint Isagawa-jinja—Nara’s oldest shrine (established in 593)—renowned for parents visiting to pray for their children’s well-being. Next, snap a photo with the five-storied pagoda of Kofuku-ji temple, once the family temple of the powerful Fujiwara aristocratic clan. Then stroll around the willow-lined Sarusawa Pond. Stroll through a pond garden, a moss garden, and a tea ceremony garden on the grounds of Yoshiki-en, and at Isui-en, see a prime example of shakkei—the Japanese concept of borrowed scenery—with Mt. Wakakusa serving as the garden’s backdrop. See archaeological objects and Buddhist artworks at the Nara National Museum. Open a bento (lunch box) on the expansive grounds of Nara Park. 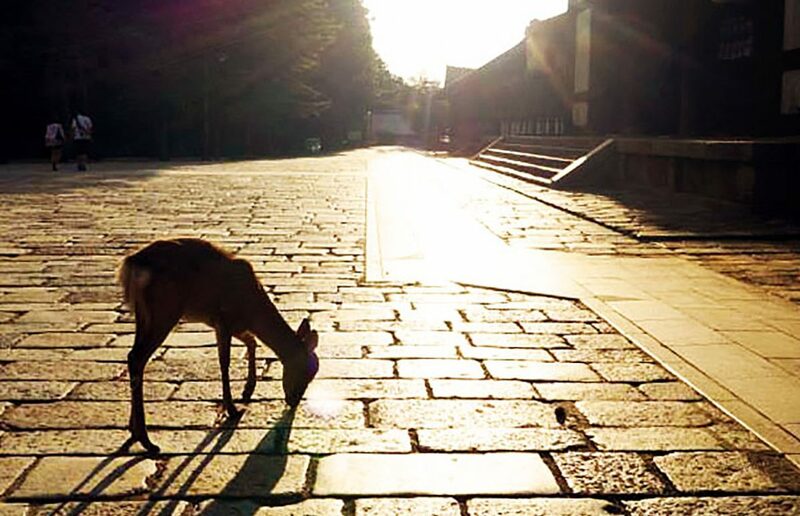 Watch out for curious, hungry deer (and purchase some deer crackers if you’re up for feeding them). Then go to the famed Todai-ji temple housing a 15-meter-high bronze Buddha statue known as Daibutsu—the world’s largest. *Every February in the week running up to Valentine’s Day, the Nara National Museum, Todaiji Temple, and Kasuga Shrine are lit up from 6pm to 9pm each night. Take in dusky orange hues then views of Nara City’s glimmering nightscape from the lantern-lit platform of Nigatsu-do Hall. *Panoramic views can be seen from the top of Mt. Wakakusa on the northern side of Nara Park; however, the mountain is closed to climbers between December and March. But visitors to Nara on the fourth Saturday of January can witness the Wakakusa Yamayaki, an annual festival during which the mountain is set on fire. Take in misty morning views of the hexagonal wooden structure of Ukimido Pavilion, which appears to float on top of the water, on an early-morning stroll around Sagaiike. Hike the 11.5km course winding through Mt. Kasuga Primeval Forest past maple trees, and ancient cedars with vistas over Nara Park and the city. Stop off at Kasuga-taisha, a shrine on the east side of Nara Park, which dates back to 768 A.D., and is illuminated with more than 3,000 lanterns. Try the famous pressed sushi wrapped in persimmon leaves made with preserved fish called kakinoha-zushi at vendors like Hirasou, one of the oldest persimmon-leaf sushi companies in Nara founded 150 years ago. Hit the historic Edo-era streets of Naramachi, the towns former merchant district, and roam past machiya (traditional wooden buildings) while shopping for local souvenirs like Narazuke pickle cookies, sweet ararezake liqueur, or high-quality Nara fude makeup brushes. Hike scenic forested trails up [Yoshinoyama] stopping at old temples, quaint cafes, and quirky souvenir vendors along the way. Experience traditional Japanese hospitality, accommodation, and kaiseki course meals while staying overnight at a ryokan (inn) and soak in the indoor and open-air hot-spring pools of Dorogawa Onsen. Explore one of the cavernous limestone formations near Dorogawa, like Goyomatsu Limestone Cave, which is reached via a tiny monorail through the forest. Wander through the impressive grounds of Kashihara-jingu dedicated to the first Emperor and the origin of civilization in Japan, situated in a preserved forest sanctuary at the base of Mount Unebi. Snap pictures of the photogenic Bishamon Kuruwa before walking on a glass-bottomed walkway from which you can view the excavated remains of the original Koriyama Castle. Soba, or buckwheat noodles, may sound pretty standard, but restaurant Gen takes this classic Japanese dish to a Michelin-star level. The zaru-soba, cold noodles dipped in a light soy sauce, is a favorite. Sip on fancy drinks at a specialty cocktail bar like Nara Lamp Bar (more details on p 23).